Download "Interim Technical Guidelines for the Development of Environmental Management Plans for Underground Infrastructure Revised - July 2013." 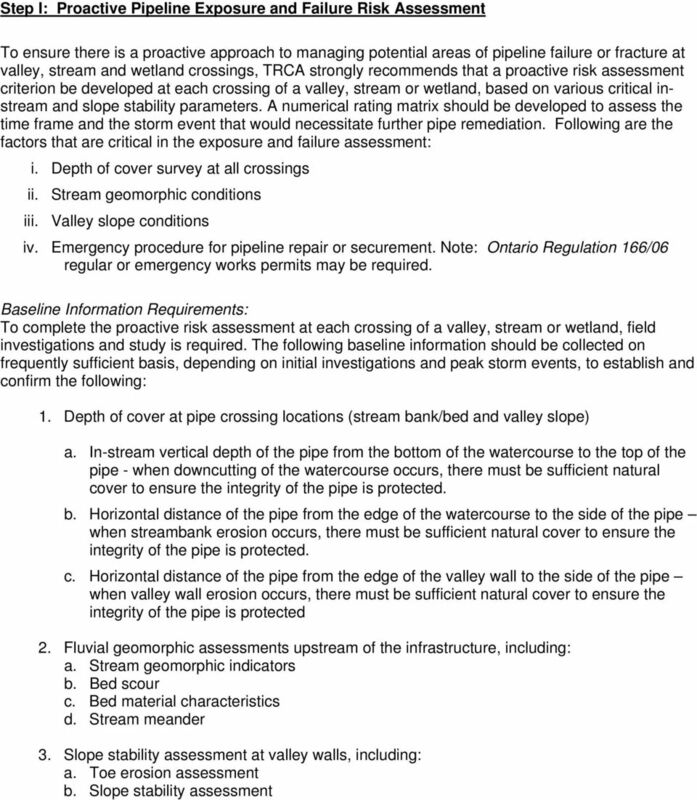 1 Interim Technical Guidelines for the Development of Environmental Management Plans for Underground Infrastructure Revised - July 2013 Rationale Underground infrastructure may be at risk from valley, streambank or streambed erosion. If at-risk erosion areas are not adequately monitored and effectively mitigated, during storm events there is increased risk that erosion of the natural cover will expose the infrastructure, and the exposed infrastructure may fail. The Technical Guidelines for the Development of Environmental Management Plans for Underground Infrastructure are designed to assist the proponent in developing a proactive monitoring and mitigation programs in advance of a spill. Through its monitoring programs, TRCA may have available aquatic, hydraulic, soil, terrestrial natural heritage, or erosion data as well as technical expertise to assist the proponent, as well as information related to infrastructure on its lands. TRCA recognizes that protecting human health and the environment are primary concerns in the event of a spill. Short-term and long term containment of materials from a spill is key to minimizing the risks. Thus, measures to prevent spills are seen as a priority. 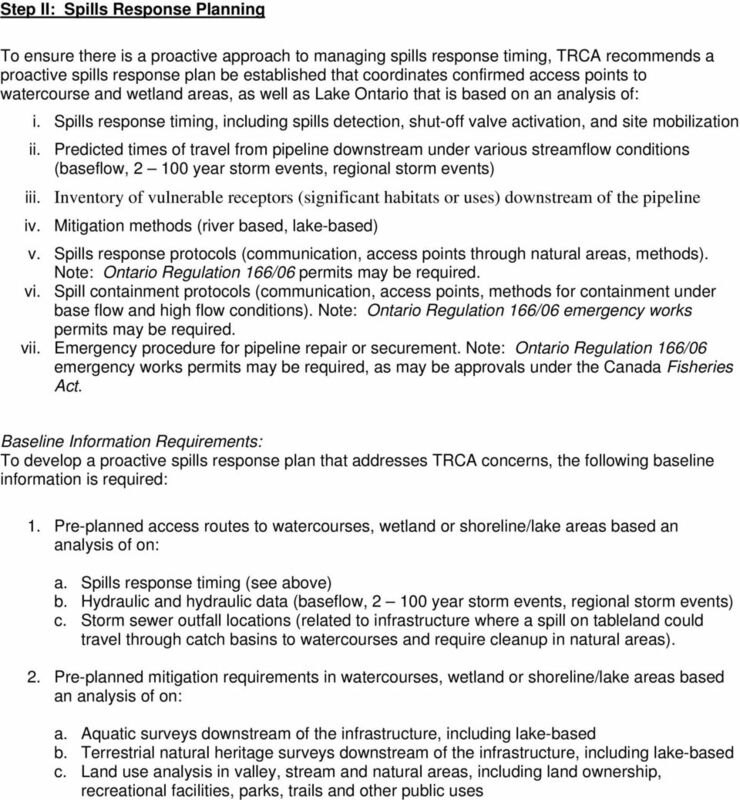 In the event of a spill, measures to contain it as close to its source are of primary concern, followed by measures to contain it within a river basin prior to its reaching Lake Ontario. Should a spill occur, it is imperative that baseline information be available to facilitate development of a remediation and compensation plan. EMP Documentation The EMP intended to be is an action oriented document. It summarizes the results of the studies undertaken in Steps I, II and III. The EMP provides detailed mitigation, monitoring, and contingency plans, and provides a detailed plan for reporting and communications for implementing the EMP based on adaptive management principles. 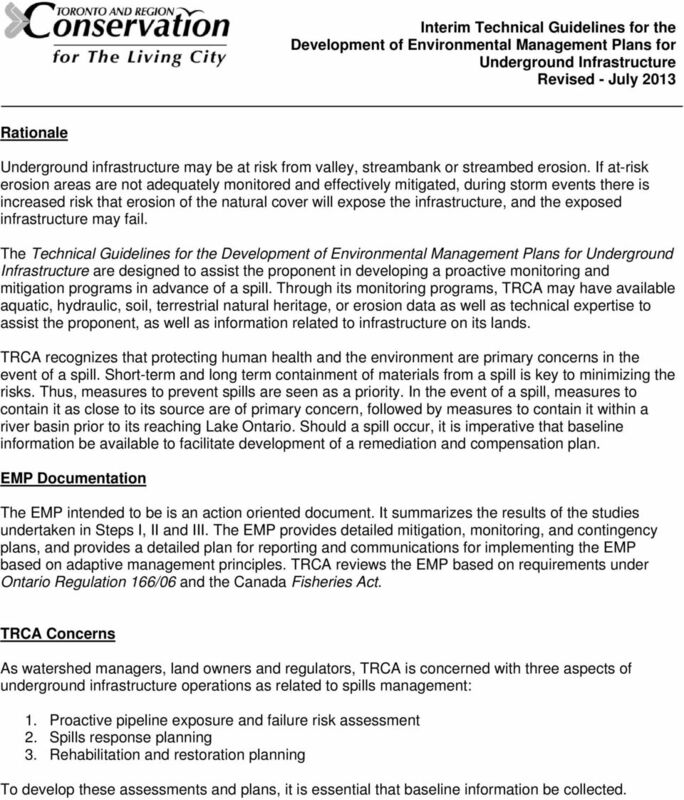 TRCA reviews the EMP based on requirements under Ontario Regulation 166/06 and the Canada Fisheries Act. 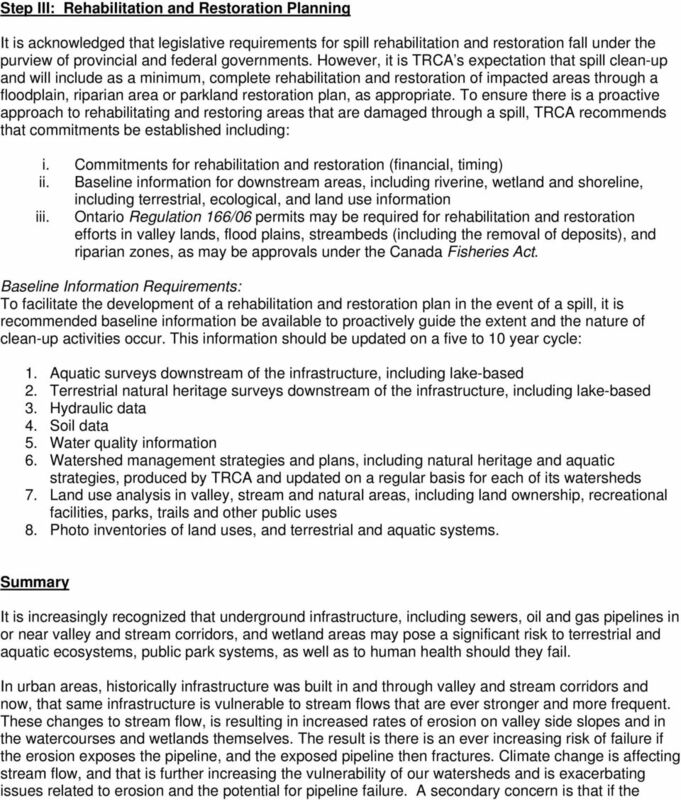 TRCA Concerns As watershed managers, land owners and regulators, TRCA is concerned with three aspects of underground infrastructure operations as related to spills management: 1. Proactive pipeline exposure and failure risk assessment 2. Spills response planning 3. Rehabilitation and restoration planning To develop these assessments and plans, it is essential that baseline information be collected. Develop hazard mitigation policies and programs designed to reduce the impact of natural and human-caused hazards on people and property. RIPRAP From Massachusetts Erosion and Sediment Control Guidelines for Urban and Suburban Areas http://www.mass.gov/dep/water/laws/policies. Rainbow Creek Master Plan Update Study The City of Vaughan june 2014 COLE ENGINEERING GROUP LTD. 70 Valleywood Drive Project Manager. Geoff Masotti, P.Eng. Markham, ON CANADA L3R 4T5 T. 905.940.6161 Ext. Why should communities invest in resiliency? What are the steps communities can take to become more resilient? DISTRICT VALUES STATEMENTS, GOALS, ACTION ITEMS, AND ONGOING TASKS FOR 2015 Adopted by the Board of Directors December 10, 2014. Values Statements. NOTE: A HARDCOPY OF THE DRAINAGE REPORT AND CONSTRUCTION DRAWINGS MUST BE SUBMITTED TO PUBLIC WORKS FOR REVIEW.